There is no scientific evidence that you should drink at any other time than when you feel thirsty - your body has a natural mechanism that tells you when you need to drink. Does your cat drink the equivalent of 8 glasses of water a day - who tells it how much water to drink? 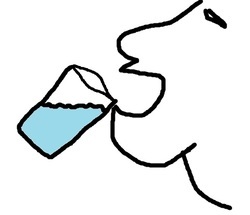 It is really the companies that bottle water who have the most to gain from your excessive drinking of water.